JU graduate student studying marine science, Andrew Lyons, working onsite on St. Simons Island. Commencement isn’t the only event on the minds of Jacksonville University students this spring. Parasites, sharks, bacteria, DNA, pathogens, migratory patterns–these topics are in the forefront of some of JU’s brightest minds. Meet Jarvis, Katrin, and Andrew, all student grant awardees from the Student Research, Creative Activity & Scholarship (RCAS) program, presenting their work in early April at the University’s annual Student Research Symposium. White-tailed deer are commonly found within the United States and are frequently known to carry infections from mosquitoes and ticks. Using genetic testing, blood samples from white-tailed deer in Maryland during hunt season were analyzed. This process allowed for parasites and bacteria to be found in the blood. The goal of the study going forward is to screen more samples from Maryland’s deer population and determine the prevalence (and types) of infections within white-tailed deer populations and allow for improvements in the field of disease surveillance. If you’ve ever wondered how many sharks live in Northeast Florida, you’re not the only one. Katrin Villinger’s research focuses on gathering data on shark movement throughout Northeast Florida, as well as habitat usage for residential sharks. Receivers will be deployed on buoys marking the Mayport inlet of the St. Johns River and other nearby sites. The team will then tag sandbar sharks and check the receivers once a month to gather data. Like Villinger, Andrew Lyons is also fascinated by sharks and wanted to learn more about our surrounding shark community. 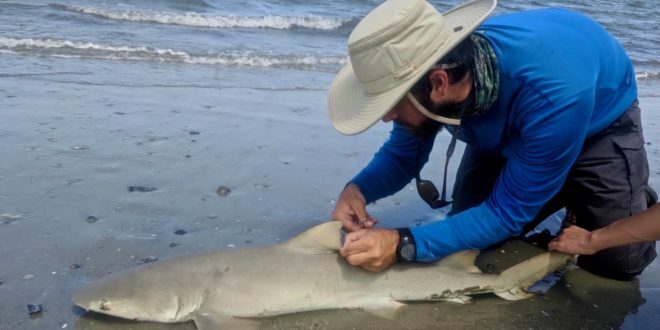 The goal of Lyons’s research is to characterize the shark community in the inshore waters surrounding Little St. Simons Island, a Georgia barrier island. Through an examination of shark population migration through this area, Lyons hopes to determine if the area is functioning as a nursery habitat for sharks. The research places a focus on lemon and fine-tooth sharks. They will be tagged to collect data on species presence, abundance, and habitat usage, as well as movements and migration. Data found from this research will be useful in developing effective management strategies for the species. The RCAS program is offered internally by the Jacksonville University Office of Research & Sponsored Programs (ORSP) and made possible by a grant from the Arthur Vining Davis Foundation. Awardees of the grant will present their work at the annual Student Research Symposium Mon., April 1, and Tues., April 2, from 8 AM to 4 PM in the Davis College of Business. For more details about Collaborate JU or the Florida EPIC Program, visit the project archive. To contact the Office of Research and Sponsored Programs, visit ORSP online. To learn more about JU’s upcoming Student Symposium on April 1-2, visit www.ju.edu/research/symposium.